Two weeks ago, my dad and I drove over to Fort De Soto to photograph the Great Horned Owl nest. At the time, the owlets were two weeks old. 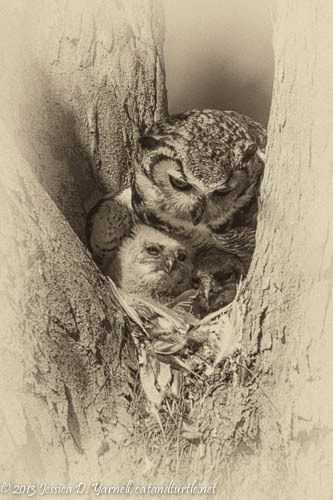 Ever since I saw Marina Scarr’s highly honored image in the Windland Smith Rice photo contest, I’ve wanted to see a similar scene – the mother owl with her owlet tucked under her wing, with only his face visible, nestled in his mom’s feathers. I hardly dared hope that I might get a comparable image. We left Orlando at 5am in order to arrive at Fort De Soto a little after sunrise. With my recent crazy hours at work, I forgot to check for road closures. We were dismayed to pull up at the entrance gate to find that the roads were closed for a bike race, and wouldn’t re-open till 9:00! So we returned at 9:00, and the sun was already starting to cast harsh shadows. We pulled into the North Beach parking lot and joined the gaggle of photographers with long lenses all pointed at the nest. 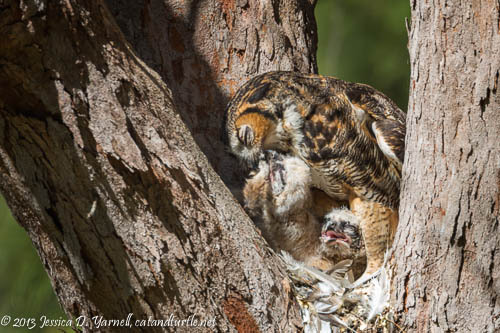 I gasped with delight when I registered what was in front of me – Mother Owl with not one, but two owlets nestled in Mom’s feathers! 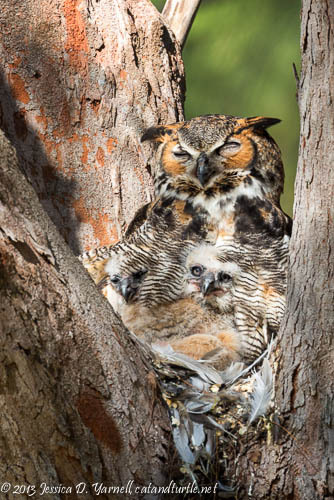 Great Horned Owl Family. Look closely at Mom’s tummy or you might miss the two little faces peeking out! These birds were incredible to watch. Mom was trying to take a nap, and both babies kept wiggling to get into a good position. It’s amazing that the mother can sleep at all with such wiggle-worms underneath her! The owlets are already pretty big, and there’s not a whole lot of room for them to move around in their tiny nest. My dad and I had a great time as we watched and photographed. It’s crazy how many pictures you can take of three birds! Soon it was time for the morning snack. Mom fed her oldest, most demanding chick first. The owlets hatch asynchronously, so it’s normal for one baby to be a few days older than the other. That baby tends to be the first to be fed. The menu included bits of seagull and squirrel. The baby owls thought it was a scrumptious feast! Feeding Time. 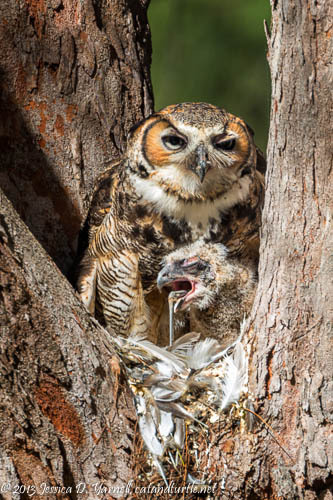 The mother owl fed her biggest baby first. Look at the little one waiting his turn on the right! At one point the older baby grabbed a bone and played with it. I guess he needed to convince himself that all the meat was already gone! I had to laugh when I got home and reviewed my images. This shot below looks like he’s spitting out the bone in disgust, which is pretty much what I would do if this lunch was fed to me! Ew – Gross! The owlet isn’t impressed by the large bone that his mom handed him. Rich is right! The sepia rocks!